Mother’s Day is the perfect excuse to take your mom on a special weekend getaway that will let her feel how much you care about her. Check into a stylish hotel in a major city where you can go shopping, get massages, visit a museum and watch a show. Or head to the country to unwind surrounded by nature and delicious food. If you are not sure where to go with your mom, consider what types of activities she enjoys the most. Would she like to take a cooking class, play a round of golf, attend a health workshop or simply relax surrounded by her family? The best way to say "thank you" is to arrange a weekend that will celebrate all the things that your mom loves most. If you are looking for ideas from specific cities, browse weekend escapes from New York City, San Francisco, Seattle, Atlanta, San Diego, Los Angeles, Chicago and other cities. Located on Chicago’s Cultural Mile, The Blackstone is one of Chicago’s iconic downtown hotels and occupies a beautiful, ornate 1910 beaux arts building. Across the street is Grant Park, while the natural history exhibits at the Field Museum are less than a mile away, as is the Willis Tower. The rooms and suites are elegant and sophisticated, many have views of Lake Michigan, and all have iPod docks, flat-screen TVs, Wi-Fi, coffeemakers, and minifridges. Club rooms include access to a lounge, free continental breakfast, and various snacks. Suites also have living spaces and/or fireplaces. A modern Spanish restaurant offers gourmet meals, and the hotel also has a coffee shop, a lobby lounge, a business center, an exercise room, and nine meeting rooms. Mystic Hotel by Charlie Palmer is a modern boutique hotel with 82 newly renovated accommodations, a lounge for social functions, restaurant and bar. 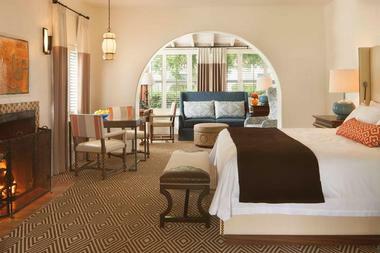 Guest rooms feature minimalist modern décor, large oversized bay windows, and 24 hour concierge service. There are three types of rooms, including 185-square-foot Mystic Junior with a double bed and exposed brick wall accent, the 200-square-foot Mystic Guest Room with a chase lounge, and the 300- to 400-square-foot Mystic and Stockton Suites with space for entertaining along with newly renovated bathrooms. Berlinetta Lounge, perfect for intimate gatherings and large events of 100 people, features lounge seating, LCD TVs, communal tables, and a customizable mobile bar. The Burritt Room is a craft cocktail bar and lounge that serves classic and handmade signature cocktails. Burritt Tavern serves unique salads, steaks and chops. Rooms start at $120 per night. The Outlook Lodge is a charming Victorian-style lodge hidden among tall green trees. Guest rooms have hardwood floors, modern and mid-century furniture, and original artwork from famous American artist Jason Willaford. All rooms come with free wireless internet access, a flat screen TV with a built-in DVD player, an iPod radio, free local calls, in-room coffee, and a compact refrigerator. The deluxe rooms have custom-made furniture, a double-sink vanity that was specially designed for the lodge, and a cushioned bay window overlooking the glorious garden. Toast a marshmallow at the outdoor fire pit, or host a special ceremony on the wrap-around porch with rocking chairs. Once you book your stay, the host will provide you with pre-arrival information, a list of local activities and restaurants in Green Mountain Falls. Rooms start at $119 per night. 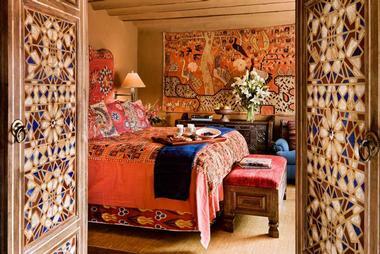 The Inn of the Five Graces is a luxury all-suite getaway in Santa Fe. 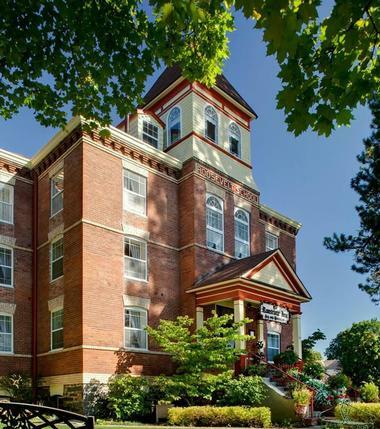 Decorated in a mix of styles reminiscent of the Orient and the Old West, the inn provides a fun base for exploring the historic city. The inn is located across the street from the Chapel of San Miguel, built in 1626, and a block from the State Capital building. The Plaza & Palace of the Governor and Canyon Road with its high-end art galleries and restaurants are a five-minute walk from the hotel. There are 22 suites decorated in a luxurious style, featuring bathrooms with large tubs and vivid tile mosaics. Continental breakfast of baked breads, muffins, fruit, yogurt, juices, hot coffee and tea is offered in the breakfast room. For lunch and dinner, sample Mexican-inspired food at the nearby restaurants. Room rates range from $295 to $525 per night plus a 10% service charge. The rate includes daily breakfast, car parking, a complimentary wet bar, daily historical walking tour followed by wine and cheese, twice daily housekeeping and local telephone calls. Tipping is not expected. If you are exploring the magnificent coast of Maine, treat yourself to a stay in the charming bright white Victorian beauty Camden Harbour Inn, overlooking Penobscot Bay and Camden Harbor. The traditional clapboard exterior, surrounded by lush greenery, hides a modern European interior with all contemporary amenities. The upscale hotel has beautiful wraparound porch for afternoon tea or cocktails while enjoying the 180-degree views and the lush garden. The rooms are modern and comfortable with plush linen and luxury bathrooms. They all have free Wi-Fi, iPod docking stations, and flat-screen TVs. Suites have fireplaces and/or balconies, coffeemakers, steam showers, soaking tubs, and saunas. 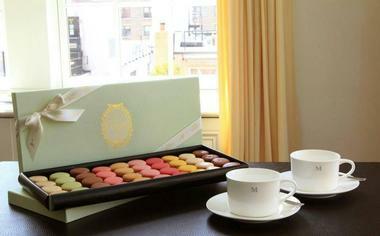 The guests enjoy complimentary gourmet champagne breakfast, coffee, tea, and snacks. Gourmet meals are available at the on-site restaurant Natalie’s, and the inn has a cozy lounge with a bar as well as a spa. 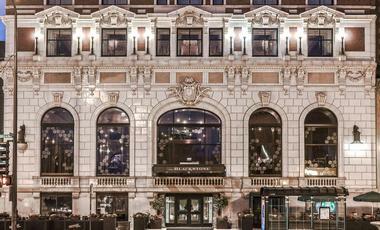 The Godfrey Hotel Chicago is a luxury getaway with a Cubist-influenced style. There are 221 contemporary rooms including 182 Guest Rooms, 12 Executive Kings, and 27 One-Bedroom Suites. 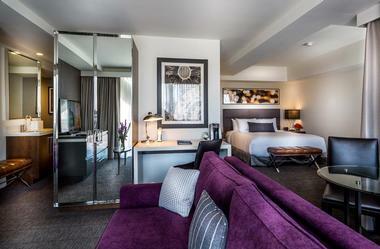 All rooms include luxury bath products, spacious workstations with ergonomic task chairs, and 46-inch HD LED televisions. Relax at Spa Boutique, a full service spa with two private treatments rooms and a long list of services, including signature facials and messages. Reach your fitness goals at the 24-hour Fitness Center which has state-of-the-art treadmills, elliptical trainers, strength and weight training equipment. 10 Godfrey is made of 15,000-square-feet of indoor and outdoor space, 10,000-square-feet of lounge and event space; it includes an indoor and outdoor bar, a video wall, and a retractable roof. Dolce Italian opens in the late spring of 2015, just in time for Mother’s Day. The restaurant will serve Italian favorites, including homemade pasta, Neapolitan pizzas, antipasti, and the signature Veal Milanese. Rooms start at $369 per night. The Mark in New York is a luxury hotel with impeccable style, offering a variety of luxury accommodations, ranging from the 400-square-foot Superior Courtyard Rooms to the Mark Premier Five Bedroom Suite. If you decide to splurge on a suite, you will get to enjoy a 895-square-foot terrace, five bedrooms, five bathrooms, views of Central Park and the Manhattan skyline. All suites and guest rooms are designed to be as comfortable as possible with lighting, climate, entertainment systems, and window shades that adjust easily with a single touch. World famous hairstylist Frederic Fekkai takes care of hair, beauty and other pampering needs. Exercise at the 1,400-square-foot and state-of-the-art fitness center and dine at The Mark Restaurant by Jean-Georges Vongerichten which serves European classics and signature global dishes. Surround yourself with pure, star-studded Hollywood glamour at the London West Hollywood, an iconic Californian gem in the heart of the Sunset Strip. Exquisitely appointed open-plan suites feature sophisticated style where contemporary décor is paired with Art Deco pieces. The suites have lavish sitting areas and spacious en-suite bathrooms with modern amenities. State-of-the-art amenities include complimentary high-speed Internet access, iHome iPod docking stations and LG flat screen televisions. All of the suites boast a personal wet bar brimming with indulgences. Soak up the Californian sun in true Golden Age style on the pool deck with views of the city. Savor a culinary experience with innovative flair at one of The London West Hollywood’s superb restaurants. Chef Anthony Keene serves up a delight of exotic southern Californian fare in the hotel’s restaurant or in the privacy of your own suite, while the bistro-style ambiance of Boxwood is ideal for all-day dining. Suites start at $380 per night. 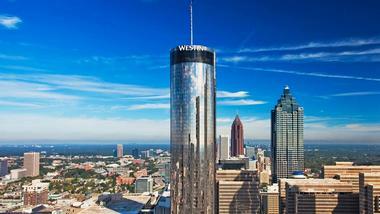 The Westin Peachtree Plaza, Atlanta is a 73-story hotel with 1,073 renovated guest rooms with floor-to-ceiling windows and spectacular city views. There is an indoor-outdoor pool on the 11th floor, concierge, fitness studio and a spa. Children receive a gift at check-in and are invited to have fun at the Westin Kids Club. Celebrate Mother’s Day at The Sundial Restaurant, Bar & View in an elegant setting with views of the city. Bar 210 serves cocktails and light fare so you can relax in comfort. Rooms start at $215 per night. The Inn at Woodhaven is an American Gothic Revival mansion located in Louisville, Kentucky. The inn features outstanding architectural details such as 14-foot ceilings, tall diamond paned windows, and arches and cupolas. Rooms are cozy and beautifully decorated with period antiques and feature modern amenities such as whirlpool tubs and steam showers, spa toiletries, cable TV, and free internet. A two-course breakfast is served each morning and can be delivered to the guest’s room if requested. Louisville is full of exciting activities, including shopping, dining, Churchill Downs, the Louisville Slugger Museum, and the Evan Williams Bourbon Experience. Chilhowee Inn is the oldest inn in Tennessee, built originally in 1902 by the Schlosser Leather Company to house visiting executives of the nearby Walland tannery. Completely renovated, this charming inn on the banks of the Little River is only half an hour from Gatlinburg and a 10-minute drive from the entrance to the Great Smoky Mountains National Park. All five guest suites are beautifully decorated with Victorian details and have a queen bed, private bath, and a cozy sitting area. 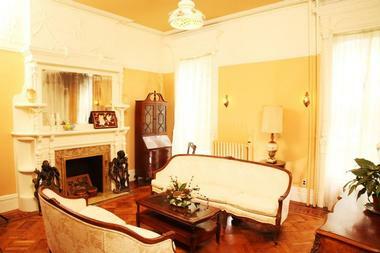 The beautiful, very comfortable family room is inviting and decorated with original art and many historic details. That is also where guests enjoy delicious homemade breakfast in the morning. For the discerning guest looking for a bed and breakfast experience that deviates from the traditional, the Mission Inn is a breath of fresh air. 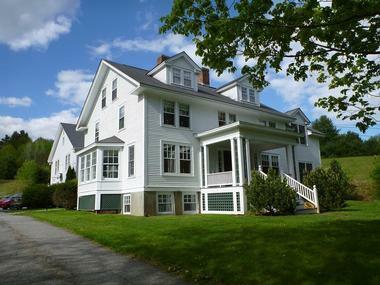 Built in 1912, the inn will have guests thinking they are in California rather than New Jersey. Each of the eight rooms is decorated in the mission style and includes amenities such as fireplaces and two-person spa showers. Breakfast is served in three different areas of the inn, including the Veranda, and features unique juices, farm fresh fruit, and the innkeeper's entrée of the day. Guests leaving early are encouraged to take a boxed breakfast. 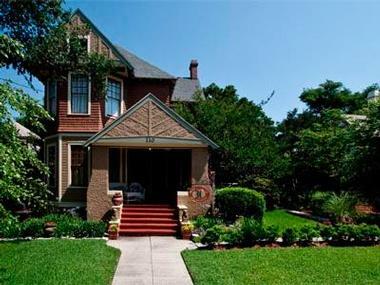 Located in a charming 1905 Tudor Revival Victorian home in the North Hill District of Pensacola, the Noble Manor is a romantic and luxurious Bed and Breakfast near Gulf Islands National Seashore and the National Naval Aviation Museum. Three guest rooms and the private Carriage House are all beautifully decorated with period antiques and fine art prints. All rooms have private baths, original pine floors, free Wi-Fi, flat-screen TVs, DVD players, and central air conditioning. Some rooms have fireplaces or claw-foot tubs in the bathrooms. The spacious front porch is a lovely relaxing area where guests can enjoy views of the lush surrounding gardens. There is also a swimming pool and a gazebo with a hot tub. A hot gourmet breakfast is served in the dining room. Founded in 1926, La Quinta is one of the oldest resorts in the Palm Springs area and has attracted many celebrity guests. If you are looking for weekend getaways from Los Angeles with many golfing choices and other activities, take a look at this unique property. Enjoy spectacular views of the beautiful Santa Rosa Mountains which surround the hotel while relaxing next to one of the many pools on your trip. For tennis enthusiasts, there are 23 tennis courts, ten with lights for night play. The spa offers a full range of treatments. After a full day of golf, try the PGA WEST Golf Massage to relax your muscles. There is also a 3,000 square foot fitness center which offers daily classes including cardio step, body sculpting, mat pilates, cardio kick and low impact aerobics. Vacationers are accommodated in Spanish hacienda design casitas and suites. Guest accommodations capture Old World charm and measure over 500 square feet. Rooms have patios with garden and mountain views or are located by the pool. Bathrooms are luxurious with an oversized bathtub, separate shower and double-sink vanity. Try one of the rooms with a fireplace for added romance during cool desert nights. Sankofa Aban Bed and Breakfast sits along a tree-lined street full of 19th century brownstones in Brooklyn's historic Bedford-Stuyvesant neighborhood. The six guest rooms in this 1880's townhouse are colorful and festively celebrate the spirit of the family that has owned the home for six generations. A unique feature of this inn is the fact that it gives visitors the opportunity to enjoy live jazz performed in an intimate setting of one of the home's two parlors. Room rates include a continental breakfast that may feature fresh fruit and berries, smoked turkey or salmon, grained breads, hot cereal, coffee, tea, and juice. The inn also boasts free Wi-Fi and a tea and wine reception upon arrival. 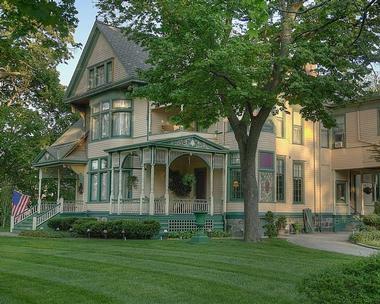 A home of two prominent Indiana families - the Olivers and Studebakers - for more than one hundred years, Oliver Inn Bed and breakfast is a magnificent Victorian mansion that offers a rare glimpse into the opulent lives of the rich and famous of the time. Located only two blocks from the Studebaker National Museum and a short walk from the South Bend Museum of Art, the Victorian beauty is shaded by dozens of stately maple trees and is a historical landmark of South Bend. 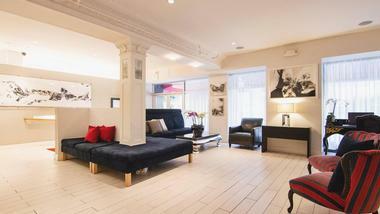 Twenty beautifully appointed rooms and suites have all modern amenities such as free Wi-Fi, cable TV, and private baths. Most rooms feature fireplaces and claw-foot or whirlpool tubs. The lovely Tudor carriage house offers more privacy, elegant Victorian decor, flat-screen TV,, luxury marble bathroom, a whirlpool tub, and a full kitchen. A gourmet breakfast is served in the formal dining room, and immaculately landscaped grounds provide a pleasant space for a stroll. The Roosevelt Inn, built in 1905, has a rich history as it was the very first permanent schoolhouse in the area. 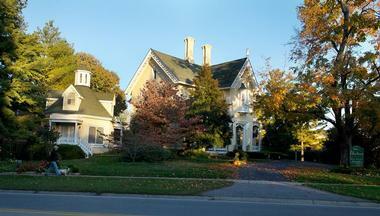 There are six suites and eight rooms for guests to stay in, and the inn is pet-friendly. Rooms have amenities such as showers, pillow top mattresses, and possibly canopy or four-poster beds, and all accommodations have lake views, hairdryers, luxury robes, private baths, maid service twice a day, USB ports, turndown service, free wireless internet, AM/FM/CD players, and irons upon request. Suites may have fireplaces or extra bedrooms and additional space. 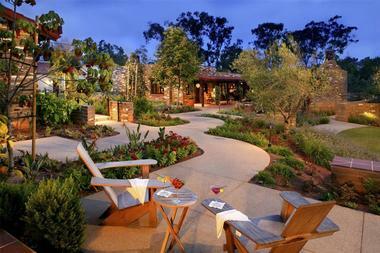 Estancia La Jolla Hotel & Spa is a hacienda-style boutique resort and spa in Southern California. Nestled between the quaint seaside village of La Jolla and Del Mar in San Diego and boasting authentic rancho-inspired architecture, the AAA Four Diamond boutique hotel exudes the sun-drenched charm and warm hospitality typical of Southern California. Surrounded by 10 acres of lush tropical gardens,tranquil courtyards, adobe fireplaces, and meandering pathways, the resort features 210 guestrooms and suites designed and decorated in comfort and style with sophisticated furnishings, luxuriousimported Turkish linens, and private balconies with picturesque views. 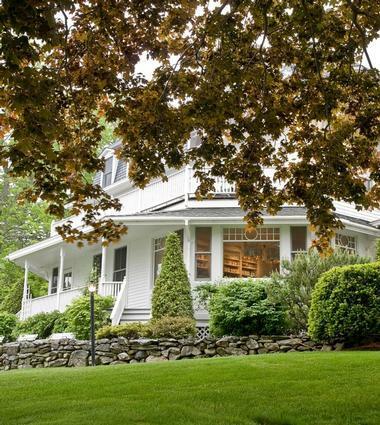 This bed and breakfast is just a few miles from Dartmouth College, and it is also close to the Dartmouth Hitchcock Medical center, making its location highly convenient. This family run bed and breakfast has been in operation since 1995. There are four rooms, a suite, and a cottage to choose from, all of which have amenities like a desk, iron with ironing board, tub and shower, toiletries, cable TV and DVD player, iPod docking station, high speed wireless internet, a radio and alarm clock, and free parking. Some rooms can sleep up to four people while others are designed for two with the ability to bring in a cot. Some rooms also have window seats or just a shower. The suite sleeps four and has two bathrooms, including one with a double vanity and a large tub. The cottage is more spacious adding a Jacuzzi tub, microwave, fireplace, wet bar, and private deck. During free time, guests can explore the 16 acres of land with its swimming pond, target golf course, gardens, and half basketball court. The daily breakfast is abundant, and you can choose the time you want to eat. It includes fresh fruit, fresh baked goods, and hot entrée choices. 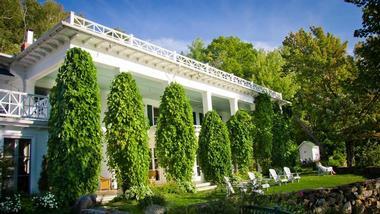 Quebec’s historic Manoir Hovey is a five-star private resort on scenic Lake Massawippi. Guests can choose from a selection of rooms and suites or stay at Dragonwatch, a lakefront cottage with its own private beach, dock, and boathouse. All accommodations include top-of-the-line amenities like Nespresso coffee machines, L’Occitane toiletries, and luxurious linens. Couples can enjoy a pre-dinner drink by the fireplace in The Tap Room, followed by a regional meal created from locally sourced ingredients. Though Manoir Hovey doesn’t offer a honeymoon package per se, couples will find the property to be the perfect destination for post-wedding relaxation. 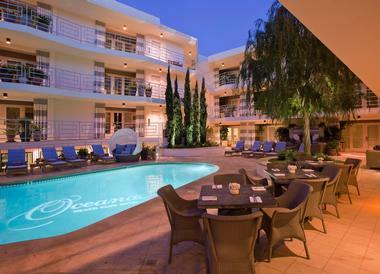 Oceana Beach Club Hotel in Santa Monica, California has a spa, pool club, a restaurant and contemporary suites. 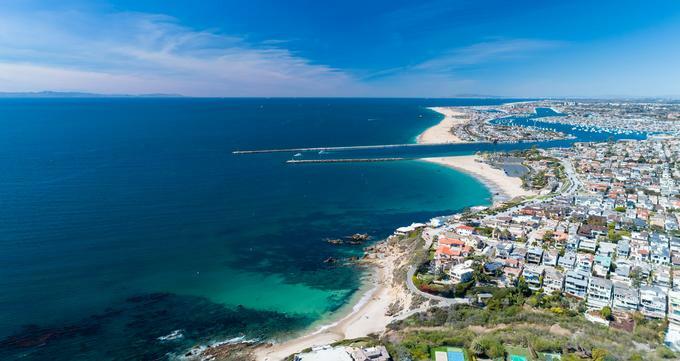 You will receive a welcome glass of Prosecco, iPads, daily yoga practice in Palisades Park, a daily hike in the Santa Monica Mountains, surf lessons and beach cruiser bicycles. The Signature Ocean View Suite is the most spacious, featuring a private balcony overlooking the ocean, a California king size bed and a roomy living room with a queen sofa-bed. 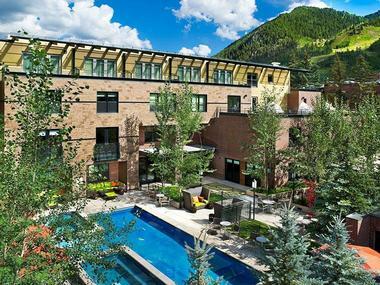 The Limelight Hotel in Aspen has scenic rooftop terraces, an outdoor pool, hot tubs and a fitness room. The hotel provides easy access to some of the best ski slopes in the world. The spacious and airy accommodations have high ceilings, marble and granite finishes, large windows, and balconies that provide mountain views. All rooms feature flat screen TVs, an iPod docking station, a wet bar and a humidifier. The Lounge serves light Italian fare made from local and organic ingredients and has a daily Happy Hour as well as live music several times a week. 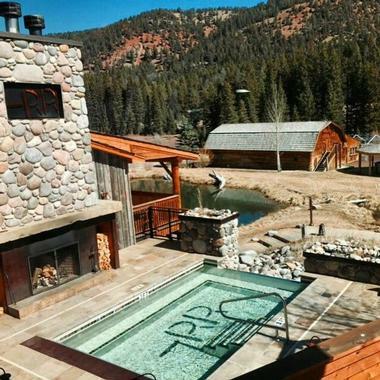 Rainbow Ranch Lodge is an award-winning luxury resort within the heart of the spectacular Rocky Mountain range, offering convenient access to both the Big Sky skiing resort and Yellowstone National Park. The lodge, which was originally constructed in 1919 as the Halfway Inn, is named for the rainbow-colored tiles that covered the roof of its first lodging building. Cozy guest rooms and suites offer wood-framed beds and amenities such as Keurig coffee machines, satellite televisions, and private deck space with river views. All visitors can enjoy continental breakfast and homemade cookies within the lodge's lobby, with amenities available such as a spa, television lounge, and massage rooms. A Montana-inspired restaurant and bar also serves up Western game dishes and an award-winning wine list.